A little preparation beforehand can help your class get the most out of its visit. A visit to the Lienzo de Quauhquechollan exhibition fits well into the social studies curriculum. It is especially useful didactically when students are studying the history of Guatemala, the conquest, or beginning to look at colonial history. Arrange for your own free, personal guided tour of the exhibition before the scheduled class visit. Prepare a list of questions for students to keep in mind during the visit. Afterwards, review them with your class back at school. Remind your class in advance what the aim of the visit is and ensure that they have time to ask their own questions. 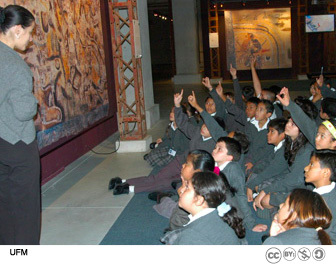 Suggest students bring notebooks and pencils to the exhibit to make notes. Work on the activities in the handouts with your class after the visit. Remember Quauhquechollan: A Chronicle of Conquest/El Lienzo de la Conquista is an excellent bilingual reference book on the history of Guatemala. Make sure your school’s library has a copy!